Before we forget the wrecks that never happened near Dogtown a week ago — when half the southbound lane in a 55-mph section of Highway 1 dropped away…. You may recall that storm water pouring off the roadbank at left undercut a 20-foot stretch of highway about 5:30 p.m. Jan. 25. 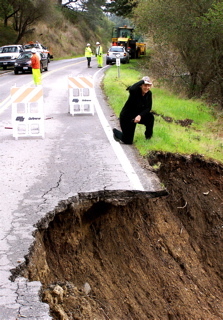 Fortunately, a Caltrans supervisor “proceeding slowly” (in the words of his boss) found the gap in time to warn motorists before any fell through it. He was also able to keep motorists from having to swerve around it at the last second, possibly resulting in head-on collisions. Eve Breckenridge of St. Helena looks down the steep slope below the missing roadway. 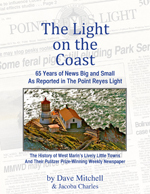 Prompting this retrospective on the event was the news about a hapless sewage-treatment-plant operator in Mill Valley. From what I read, he didn’t leave enough pumps on when he went home last Thursday night (apparently not anticipating how heavy the rain would be), and this caused the plant to overflow into San Francisco Bay. The result, of course, has been an environmental and public-health headache. By way of contrast: Caltrans spokesman Bob Haus yesterday got for me the name of the road-crew supervisor who was keeping an eye on the condition of Highway 1 thoroughly enough to be proceeding slowly. When supervisor Eamonn Dymer rounded a curve and discovered half the lane ahead of him ending abruptly in a high dropoff, he was able to stop in time and then alert others. Most people would have expected any storm damage that dangerous to be more visible from a distance, but the supervisor, who is based at the Manzanita Maintenance Yard, was properly observant and thus careful. In today’s sense of the word, supervisor Dymer wasn’t heroic. Nowadays that term is usually reserved for the player who scores the winning touchdown. But because supervisor Dymer went about his job the way he was supposed to, he was able to avert some horrible crashes. The two incidents should be a reminder that despite the attention we give politicians and celebrity CEOs, it’s our too-often-forgotten working people who mostly determine whether our country is safe and functioning. But unless they screw up, we seldom talk about them. It makes me wonder whatever became of society’s admiration for diligent workers. These days it’s little more than perfunctory speeches on Labor Day and employee-of-the-month photos on retail-chain walls. We may be in the 21st century, but we need to remember that the real heroes are still hardworking people going about their daily jobs. “We need to remember that the real heroes are still hardworking people going about their daily jobs.” I couldn’t agree more, Dave. How often has my day / life been made better and safer through some hardworking woman or man who went beyond their job description and made extra sure you got the best service. But who gets all the press? Paris Hilton. Sparsely Sage and Timely is powered by	WordPress 4.9.10 and delivered to you in 0.215 seconds using 52 queries.